With small towns like Tarboro, Rocky Mount, Macclesfield, Sharpsburg, Leggett, and Princeville—the oldest town incorporated by African Americans in the United States—Edgecombe County offers unique history and special character. Residents and visitors enjoy hiking, biking, and paddling trails along the Tar River, tasting local barbecue, touring museums, and enjoying the arts. On June 19, 2018, the Hometown Strong Action Team joined Department of Transportation Secretary Jim Trogdon, Department of Transportation Chief Operating Officer Bobby Lewis and Department of Information Technology Secretary Eric Boyette to meet with local leaders in Edgecombe County. While many rural counties have suffered population losses in recent years, Edgecombe has been recognized for its economic potential. 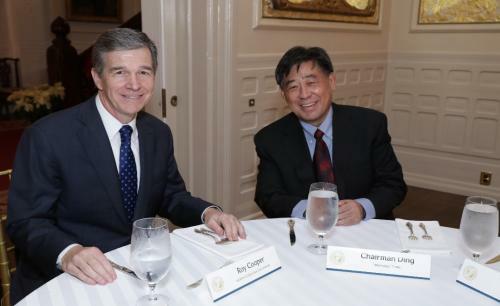 Last year, Governor Cooper announced that Triangle Tyre would bring the largest-ever manufacturing investment in rural North Carolina to a new facility in Kingsoro, bringing nearly 1,000 new jobs to Edgecombe County. Local organizations like the Conetoe Family Life Center and the Opportunities Industrialization Center are offering training and development opportunities to help employees succeed in securing good-paying jobs. In 2016, Edgecombe County communities like Princeville were devastated by Hurricane Matthew. Recovery efforts remain ongoing, and the Cooper Administration is focused on helping communities in hard-hit areas rebuild smarter and stronger to become more resilient against future storms. As a follow-up to the June visit, the Hometown Strong Action Team members and local leaders identified workforce development, access to telehealth, infrastructure improvements, and greater investment in public education as priorities and possible points of state and local collaboration. Triangle Tyre, based in China, will build a manufacturing facility at the Carolinas Gateway Partnership. This location has been selected by Triangle Tyre for its first U.S. manufacturing facility. The Chinese tire manufacturing company will create 800 jobs and invest nearly $580 million at a 1,449-acre advanced manufacturing megasite site located in Kingsboro.